Want to travel round the world but also make it back in time for Monday’s meeting? 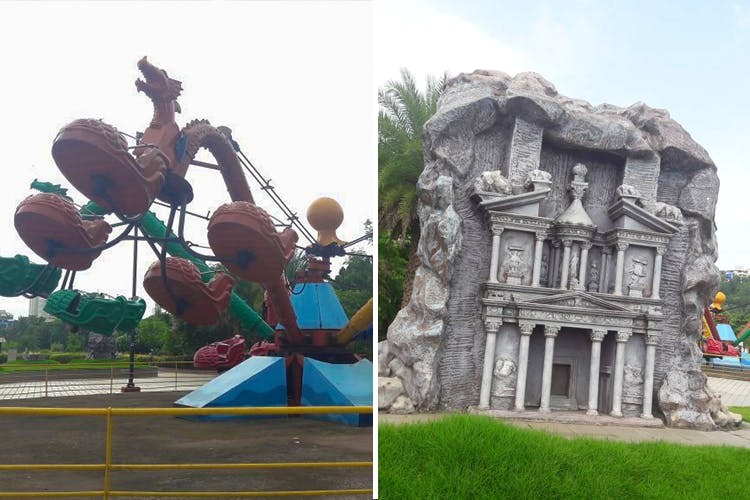 Check out Wonders Park, an amusement park in Navi Mumbai which has miniature version of the seven Wonders of the World. There’s beyond Imagica and Essel World if you want to explore an amusement park in Mumbai. This 5-year-old amusement park is located in Nerul, Navi Mumbai and has a lot to it than meets the eye. We hear that most notable thing about the park remains that it has miniatures of the Seven Wonders Of The World such as the Taj Mahal, Colosseum, Chichen Itza, Petra, Machu Picchu, Cristo Redentor, and the Great Wall of China. What are some other ways to spend your time here? They have a ferris wheel, a lake to sit by and get this: a giant life-sized chess board that you can play a game of ches with if you’d prefer keeping your feet on the ground. A few other activities here could be taking a ride on the toy train within the amusement park, sitting in the amphitheatre, and setting up a picnic by the lake. Wonders Park is green, spacious and with plenty to do within it. It’s especially fun to go in a larger group with kids, so make a family outing of it.